Joan Burns Service Details - Newcastle, Ontario | Newcastle Funeral Home Ltd.
Born November 4, 1932 – died in her 86th year on August 26th, 2018. Survived by her devoted daughter Karen, her grandsons Jon Sanders and Justin Sanders. Also survived by her son Narlan, his wife Karen and her only granddaughter Patina, her great-grandchildren Sheldon and Preston and her grandson Narlan Jr.
Beloved sister of the late Lenore Scott of Peterborough, whom she loved very much and Lenore’s children of whom she was a favorite Aunt of Rhonda Johnston of Peterborough and great aunt of Emila and Devon. Best friend of Diane England of Whitby and Doreen Johnston of Peterborough. Thanks to Maryanne, one of the best PSW’s going. Also thanks to the staff of Oshawa General Hospital and Whitby Rehab Hospital for their care. Born in Temogami to Mable and Emile Martel. She was adopted at age 4 by David and Mary Gray. Her father died when she was 2 months old and a fire when she was 4 caused her to be put up for adoption. She found and met her birth mother when she was 40 as well as her brother Allan Martel and 3 sisters, Olive, Pauline and Anne. Mom survived polio at age 17 and went on to graduate in 1953 from St. Joseph School of Nursing in Peterborough. Mom worked all over the province of Ontario in hospitals for over 45 yrs. Mom started a new career in real estate in her 40’s and worked in that career until she was 75 years old. 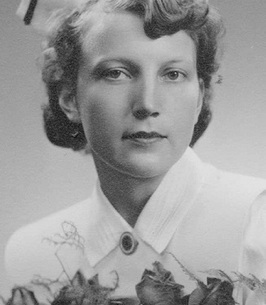 Mom was a character all her life and people will remember her for her telling of jokes, her sense of adventure, her courage and her ability to survive many situations. She was a woman born before her time willing to break all barriers and lead the way for independent, strong women and a fine example to her family. She would help anyone when needed but didn’t tolerate fools either. To all the lives she touched, and there were certainly a lot, you always learned something from Mom didn’t you. Thank you for your kind messages, thoughts and memories. Thank you to my friends for all their support through this challenging past few years. I was privileged to be her daughter and learned the most. To send flowers to the family of Joan Adele Burns, please visit our Heartfelt Sympathies Store.